Welcome to the world of Aventra! You will take part in this adventure as an Alchemist from the Enclave and brew different kinds of concoctions along your journey. 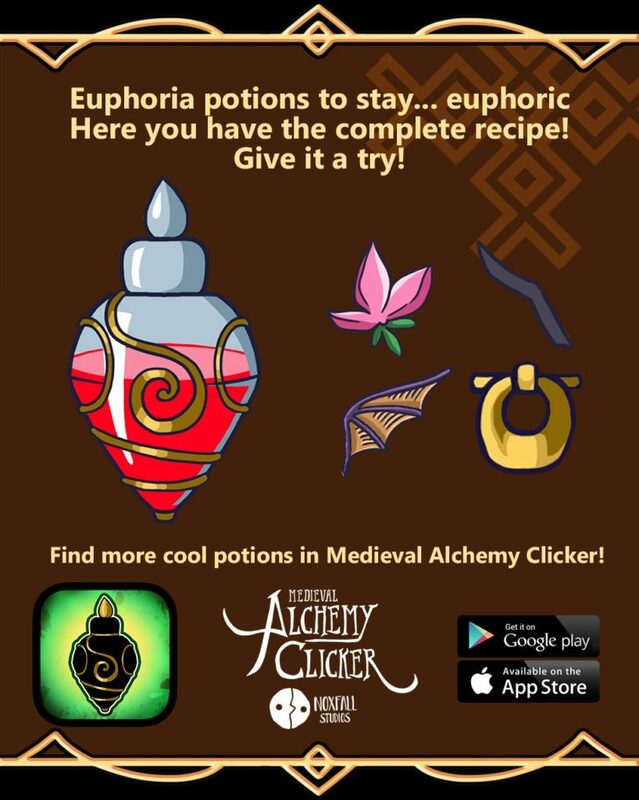 Become a master potion maker through multiple levels and completing tasks! You will start the game as Zantras, he is an old school pal, living proof of a legend as he likes to call himself. Your first mission will be to craft a Health Potion. An easy tutorial will guide you through this task. As you progress in the game, new materials and potions will be unlocked. Don’t forget to upgrade material levels. The more you do, the more money potions will be sold for. Your abilities can also be upgraded, you must be strong in order to defeat the boss missions! 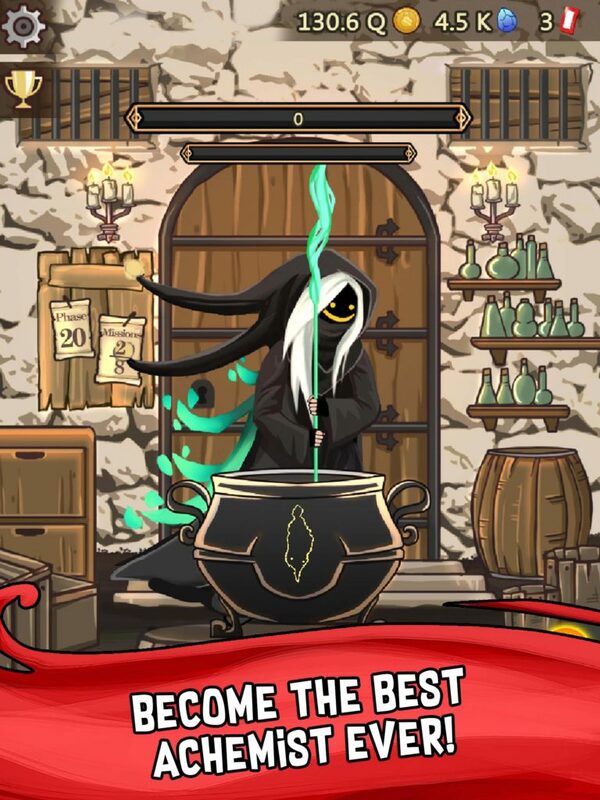 Tip: Take into consideration that the more potions you brew of the same kind the harder they will be to craft. But don’t worry about this now, you won’t need to brew that many potions to continue on your adventure. Time Vortex: This is our prestige system. When you use a Time Vortex stone, you will go back in time and start from level 1. The cool thing is that you will earn Evolution stones which can be used to upgrade some abilities permanently! – Global Ranking: every month we will reset the global ranking. The top 5 users will earn free blue gems! – There are 3 kinds of missions: gold taxes, potion brewing, and estabilization. You can make a reroll if you want to change the mission you got. ● This game is a clicker game and it is based on a single input. Click with one finger, two or as many as you need so your alchemists can craft potions as fast as they can! ● This game is an incremental game, this means it will become tougher as you progress in your adventure, but much more fun! 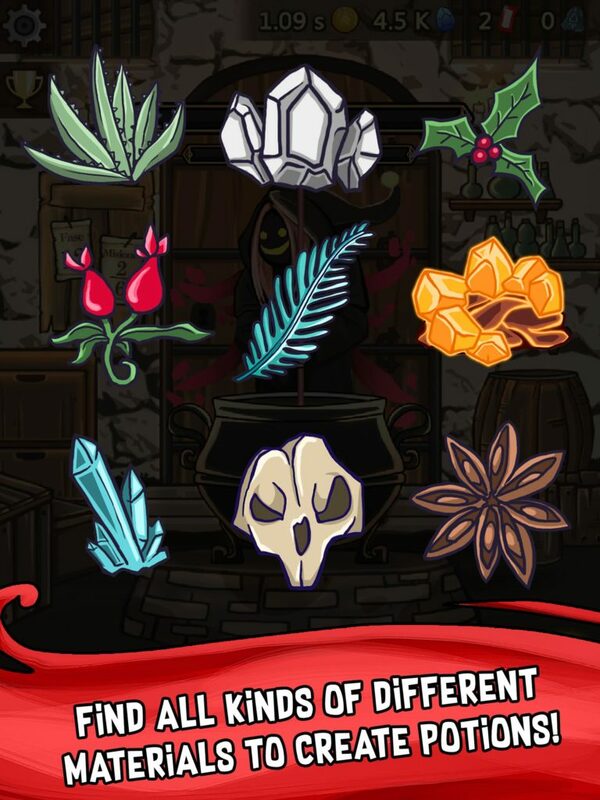 ● Loads of different ingredients: You will discover 1 new ingredient per phase, and that will unlock 1, 2, 3 or even 4 new potion recipes to craft depending on how far you got in your adventure! ● A gallery in the form of a recipe book, so you can enjoy all the potions you craft through your adventure whenever you want. ● An epic story which will make you feel as though you are inside this medieval fantasy world, making the adventure more real! ● Dozens of upgrades for your alchemists, ingredients and potions to make your game experience even better! We are an indie studio created in early 2018. Before starting our company we were just three friends that loved making video games together as a hobby. Our first game was… let’s say not very well planned. However, we decided not to give up and continued to try new things. We started making small games and exploring new themes. That is how Medieval Clicker (the previous adventure to Medieval Clicker Alchemy) started growing. After the amazing response from our players, we decided to make this Alchemy game as a Part 2. We also take education very seriously and have started investigating that area. This article was Published by Edamame Reviews, Written by Noxfall Studios.